COOFANDY creates attractive fashion items, satisfactory service, great shopping experiences for our customers in the world. We strives to share high end design and reasonable price with fashion oriented people. 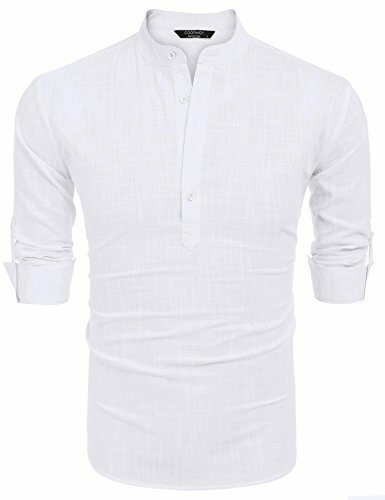 This attractive stylish shirts has Neat and Urbane design. This will look good with dress pants, slacks, chinos, and jeans. 【STYLISH DESIGN】: Casual henley neck shirts, lapel collar, button-down closure, rounded hem, long sleeve(Roll-up) features button detail, solid color with simple style, S-XXL available, ensures perfect fit. 【CLOTHING MATCH】: These long-sleeve stylish slim fit shirts could be easy to match with other clothing styles...will look good with dress pants, slacks, chinos, and jeans. 【Easy to Wash】:Machine / hand wash.
【Size Suggestion】:Please check product description before ordering to ensure accurate fitting. Some buyers said that our size is smaller than US size, so you can choose a larger size than our measurement chart.